And the larger Delica and Endura models. This review sample was purchased from Amazon and got here in 2 days with Prime. I ordered it on a Saturday, and received it the next Monday- nice! The Dragonfly is designed to be lightweight but functional. The design gives you lots of bang for your buck. The amount of blade surface you get for the weight is phenomenal. The FRN handle is rigid, but it's definitely not as rigid as having a steel or aluminum liner. It's the blessing and curse of lockbacks. But in practice, the lack of rigidity isn't a big deal for EDC. In daily use, it's a great design. The Dragonfly 2 has a fairly classic Spyderco leaf-shaped blade, complete with the also classic "spidey hole" for one-handed opening. It also has a laser etched spider and jimping on the spine and choil. The blade is made of VG-10 Japanese steel, as with the rest of the line. It's a little harder to sharpen than some cheaper steels, but it holds an edge well. It's just a good steel. The blade appears to be a little on the thin side to me, and I've seen a couple reviews make mention of this, but looks can be deceiving. For daily use, the blade stands up well to most forms of abuse a pocket knife will encounter. Over time, the blade in mine has held up well, even to numerous sharpenings. I can always keep a scary sharp edge on it. It's forming a little bit of oxidation on the portion of the blade which is exposed when the knife is folded. So, after a year, the blade shows a little character. The blade was made to be choked up on, and has a great feel to it if you like holding a knife choked up, which personally isn't my thing. Though I do sometimes hold it with my thumb in the forward position. The handle uses a very strong but light fiberglass reinforced nylon (FRN.) Since it does not have a full metal lining, the handle isn't as rigid as most liner lock knives. In fact, if you squeeze the handle at the mid point when the knife is open, you can almost make the scales touch at their closest point. However, I personally believe that the lighter weight is a good trade-off. For EDC, I don't want the extra weight. 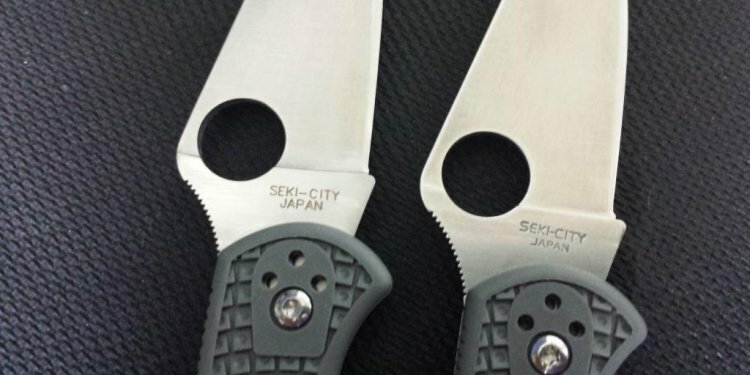 Spyderco calls the texturing on the handle "bi-directional" but doesn't go into much detail about it. What that means is that the raised texturing points in different directions on the top and bottom, giving the handle a solid feel. The Spyderco logo in the center of the handle is the only smooth spot. It'd be nice if the texturing covered 100% of the handle, but it still has an excellent feel for such a small knife. The handle has two removable Torx screws, one for the pivot and one to fasten the lock to the handle. Like everything about this knife, the screws look undersized and help contribute to the knife's almost austere look. But the screws, like the other hardware, is completely sufficient for the design, and contributes to its low weight. The clip is a wire clip common to this product line. It is a deep carry clip configured for tip-up carry, and can be moved to the left or right. It has a good feel: not too loose or tight, and can be removed like I did to mine. Without the clip, the Dragonfly 2 is only one ounce! This Spyderco line is clearly designed to be "ergo." To me, they have a better feel than other small, EDC type knives I have carried. However, I think that the ergonomics will vary from good to perfect depending on your hand size and the Spyderco knife size you have selected. For example, the Dragonfly is just a hair small to have perfect ergonomics with my medium to large hand size. So for me, the ergonomics of the Dragonfly are good, but not perfect. The Delica will be the next in the line for me, but I think it might have a perfect feel only to be a little on the heavy side. But all things considered, this knife is about as ergonomic as you can get for the size, and obviously a strong selling point not only of the Dragonfly, but their whole Japanese line. This knife is form and function. It has a fairly typical back lock: simple and functional. My sample has a smooth and solid lockup, with no play, even after nearly a year of daily abuse. I probably haven't stressed the lock excessively, but I just get the feeling that it'll never fail under normal use. Overall, superb. I had high expectations when I ordered this knife, and it didn't disappoint. Blade, handle, lockup, pivot-everything pretty much perfect. The only couple tiny imperfections were the Seki City stamp: it didn't look like it got a good strike on the blade, and a little roughness on a couple texture spots on the handle, which smoothed out with use. Seeing this great fit and finish on the Ladybug and now the Dragonfly is very encouraging. The usability on this knife is fantastic considering its weight and size. I own a duckload of pocket knives, and I can always find a larger one to carry; that's not a problem. I can carry one with more blade surface or a more robust lock. But after carrying all those different knifes, I still haven't found one much more functional on a daily basis than the dragonfly. Daily tasks for my EDC world tend to be opening lots of packages and mail, breaking down boxes, various handyman type tasks and even occasionally light food prep. I use it 15-20 times a day at least. And because everyone who knows me knows that I carry an EDC knife, it gets some serious random use in as well. Unfortunately, working as a while collar computer nerd, most people would be uncomfortable seeing me bust out one my larger folders like the the Spyderco Tenacious in an office environment. People are under the impression that I'm a responsible adult, so I have to factor that into my overall choice of what knife to carry when I leave the house. So far, I have found the Dragonfly to be generally perceived as non-threatening, and even a little nerdy because of its exotic look. This one, like virtually all other Spyderco knives, can be easily and smoothly opened one handed. I have found one handed closing to be hit and miss for various knives, though, but I can easily close the Dragonfly one handed- see picture below. After some practice, I can also even open the knife one handed upside down, using my ring finger on either hand. With all the daily use my Dragonfly gets, I have to sharpen it about once every two weeks to keep the scary sharp edge I like on my knives. I use a Japanese whetstone to do the sharpening, and I usually go straight to the fine side of the stone as long as I didn't wait too long between sharpenings. I can't say enough good things about this knife. This is my third Spyderco, and the one that made me into the fanboy I am today. This is also the knife that taught me I can have all the functionality I want in an EDC knife without any of the weight or bulk. I still do carry bulkier knives occasionally, but for most EDC tasks, the Dragonfly is the shiznit. They say the best knife is the one you have with you, and for how light this knife is, it's almost always with me. This may just be the ultimate EDC knife. I know from surfing various Internet forums, I'm not the only one who feels this way about the Dragonfly, or even the whole line. I'm looking to get a Delica next.